Amalgam wastes include scrap (dry or non-contact) amalgam and amalgam particles and sludge found in chairside traps, pump filter canisters and the sludge from amalgam separator wastewater treatment units. The companies listed below have different sizes of buckets for amalgam waste depending on how that waste is generated. The cost of the buckets include transportation and proper disposal. Hazardous waste companies will send a manifest for your files after they have received your bucket of waste. We suggest supporting local companies - if the charge is reasonable and the service is good. The company that currently takes your "dry amalgam" may very well also have service for the amalgam sludge. Maguire & Strickland of Minneapolis, MN (800-486-2858) currently charges approx. $150 for their three gallon "sludge" bucket. 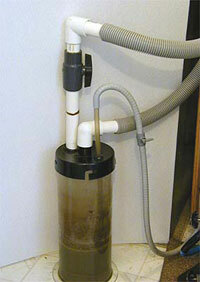 We anticipate that you will be able to get two "emptying's" of your Amalgam Collector canister into one bucket. Amalgaway of Indianapolis, IN (800-267-1467), also charges approx. $150 for their two and one half gallon buckets. Both M & S and Amalgaway have different sized buckets for your dry amalgam, i.e. chairside traps and contents, and for your pre-vacuum canisters and contents. Another option is for you to order from us a new canister and a lid with no "holes". With this arrangement you merely "change out" your canister. We do not recommend this option as our units are truly designed to be a one-time-only purchase. Current prices for "change-out sets" start at $350. You should not need either the bucket or a change-out-set for 2-5 years. Please give us a call if you experience any problems with the clean out or disposal of your unit. We will also make calls for you to find the most reasonably priced service in your area.